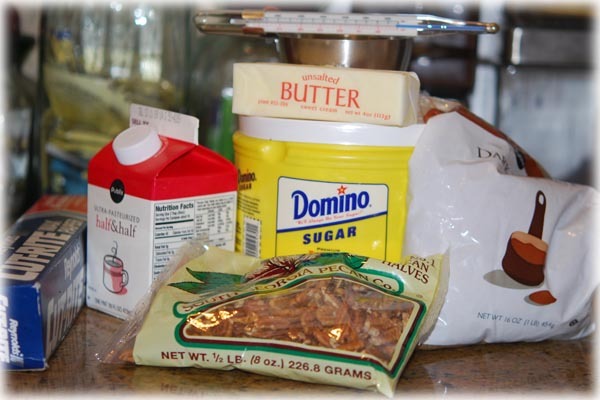 Mix the sugars, butter and half & half and stir over low heat in a heavy pot until the sugar dissolves (about ten minutes). 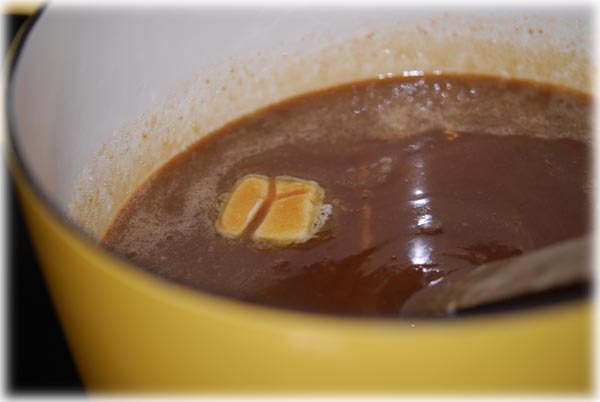 Once the sugars are dissolved, turn the heat to medium and do not stir. Cook it to the soft ball stage. The original recipe said the medium ball stage, which I take to be between the soft ball and firm ball, but if you cook it that long, (which would be between 240 and 245 degrees F) you will have a difficult time getting them spooned out. I think if you cook them to about 235 which is soft ball, you are going to get your best results. I recommend you use a candy thermometer. 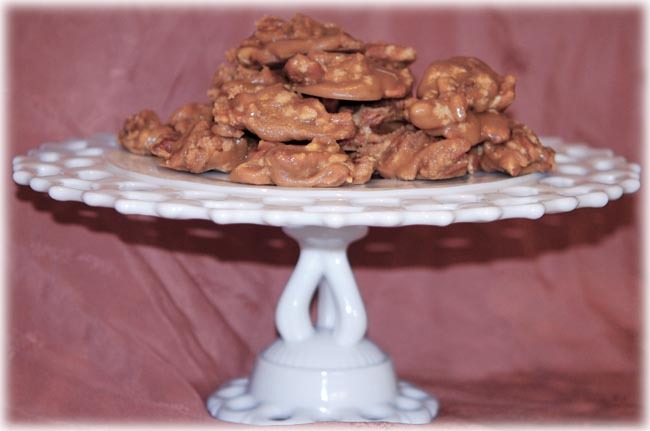 If you cook it too long, you will end up with sugared pecans, which is ok, and you can feed them to your kids and husband, but they are not quite as impressive as pralines! And it’s difficult enough to spoon pralines out when you do it right. So try not to cook them past the right temperature. Really. I’ve done it wrong enough times, I know what I’m talking about in this case. BTW this stuff is HOT and it will burn your tongue. I also know this from experience! You should go ahead and check your candy to see what the soft ball stage should look like, even using a candy thermometer. I have included a photo, because when I was learning I had never seen what it was supposed to look like, I hope it’s helpful. Be sure to drip the hot syrup into cold water and then pick it up with your fingers. It should hold together and form a ball, and you should be able to flatten it out. It’s pretty mushy but it holds together. This is all good stuff to know. The really fun stuff is when I do my divinity recipe, just wait! I may have to get my new video camera out for that! By the way, the original recipe I had said it would take about 5 minutes to cook to this stage. HA! I never ever had it take that short a time. The first time I made this, I must have dripped half of the syrup into glasses of water, waiting for it to get to the right stage! It takes awhile to get to the right temperature. So, a candy thermometer will make you feel in much better control of things. Immediately when your candy reaches the soft ball stage (235 – 240 degrees F but seriously closer to 235!) 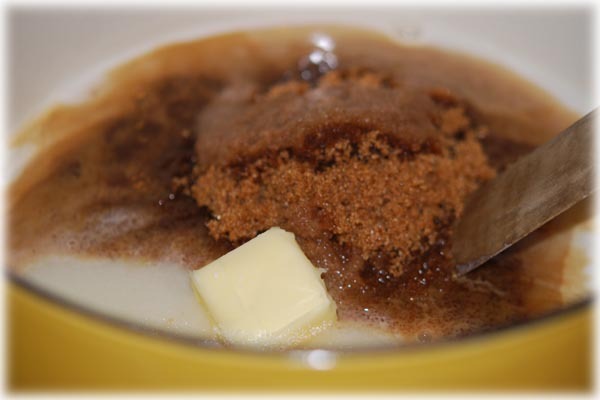 take it off the heat, add the vanilla, set it in the sink (so you don’t sling hot syrup on anything) and beat it to cool . As it loses it’s gloss add pecans and drop by spoonfuls onto waxed paper. The first few are easy enough, but if you can enlist a helper it’s easier as the faster you drop them the better. You’ll see why. The best method I’ve found is to drop them with one spoon and to “help” them along with a second one. They aren’t really pretty, but they are so wonderful no one cares. They taste like little pieces of Heaven. 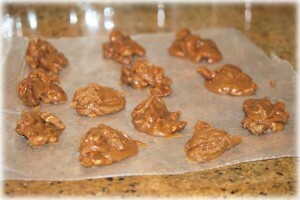 My original recipe says it makes 10 to 12 three inch pralines. I always make them smaller so I get about 20 from one batch, and I think that’s perfect. Also, and this is important, don’t try doubling the batch to make a larger amount. You will be sorry! There’s no way to get them spooned out before you end up with a mess. Just make a second batch or third batch if you want more. Now, go make someone happy! These pralines look delicious and will certainly give them a go, than you for sharing. Hope have not posted twice but my comment disappeared mid type. These look lovely – I bet they taste great too !